More than anyone before him - more than Beethoven, Byron, even the preternatural Paganini - it was Franz Liszt who created one of the most enduring archetypes of the Romantic era: that of the artist, "who walks with God and brings down fire from heaven in order to kindle the hearts of humankind." An innovative composer both for his own instrument and on an orchestral scale, Liszt was without a doubt the greatest pianist of his time and perhaps the greatest of all time, stunning even the most jaded critics and listeners everywhere he went with his sheer virtuosity and almost unbelievable musical gifts - even while playing whatever instrument was available in whatever hall he could find during his arduous travels by mail coach throughout Europe. Yet even though his fame and achievement make him one of the most written about composers of the 19th century, musically he remains the least understood. And as for his life, perhaps a good place to begin is with Felix Mendelssohn's observation that Liszt's character was "a continual alternation between scandal and apotheosis." Still, for every lover of music, Liszt remains someone you must understand, and this eight-lecture series is an ideal place to begin your acquaintance with both the man and his music. Would you listen to Great Masters: Liszt - His Life and Music again? Why? 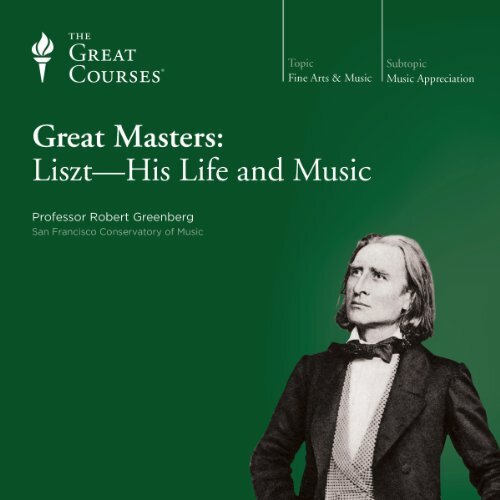 The Great Courses series can often be a mixed bag of tricks, but Robert Greenberg's "Great Masters: Liszt - His Life and Music" is the third Great Masters lecture series I've downloaded and the best so far. Not only has Professor Greenberg enlightened and clarified certain aspects of Liszt's career, his insight into the scores and physical requirements of the performers were fascinating to listen to. Of all the varied Great Courses I've sat in on, Greenberg's are the most thoughtful, well researched, best organized, most clearly articulated and, without a doubt, contain the greatest level of enthusiasm. My only complaint was that the course eventually ended. The professionalism of Professor Greenberg was exceptional. No stuttering "ah, ah" pauses, extreme organization and captivating audience engagement. The man loves his work and succeeds in passing that endearment on to the listener. Justice was certainly done to the great Franz Liszt. The professionalism of the lecturer. No "ah, ahs", extreme organization and audience engagement. The man loves his work and succeeds in passing the love on to the listener. Impossible to say. Every moment was riveting. I was surprised that someone so flamboyant and as self-engrossed as Liszt could be so generous. I plan on listening to all of Professor Greenberg's lectures. I would strongly recommend Great Courses engage him for more courses. just as the title of my review states... a tremendously talented man... Liszt. almost equaled By the fantastic passion and presentation by Ronald Greenberg. Is Robert Greenberg Audibles best narrator?I think so.So to all music lovers,listen to Great Masters:Liszt,it's simply the best. What made the experience of listening to Great Masters: Liszt - His Life and Music the most enjoyable? I thoroughly enjoyed this lecture series on the life and works of Liszt. Didn't realize he was the musical idol of his day. It was so good, that I never paused! If you like Greenberg, you will like this book. I will look for any other presentations by Professor Greenberg. He turns his love of the story into my love of the story. In these 8 lectures (performances), the professor brings a musical genius to life, allowing you to follow his life, talent, and intrigue, in a way someone living in that time would have appreciated it. Thank you. Lizt was on my list and should be on your! Dr Greenberg as usual is very informative and interesting. I evan think his jokes are funny. I have listened to almost all of his composers series. Dig in deep and learn about these great men. What other book might you compare Great Masters: Liszt - His Life and Music to and why? All of Dr. Greenberg's lectures will enthrall you so buy this and all his lectures on the great composers they are cheap and short.